The Research Animal Facility at the Chulabhorn Research Institute is a 5-storey building comprised of two wings. There are 2 floors of animal research rooms, each with 10 individual rooms of 19m2 size for housing and maintenance of animals for individual studies. 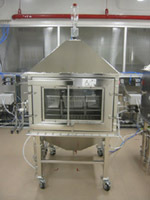 The facility is designed for a one-way workflow, with clean and dirty corridors to minimize the chance of cross contamination. One floor of the facility is dedicated to the Inhalation Toxicology Laboratory, which consists of 6 animal research rooms of 19m2 size, and 2 inhalation exposure rooms of 38m2 size. Environmental parameters, e.g. 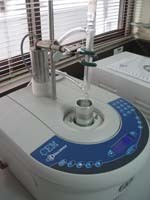 temperature and relative humidity, are controlled and monitored through a computerized system. Standardized protocols have been developed and updated as part of CRI’s efforts in operating the Research Animal Facility according to Good Laboratory Practices (GLP). It is envisioned that CRI will dedicate part of the Research Animal Facility for contract research in the future. The state-of-the-art Rodent Inhalation Toxicology Facility enables CRI to carry out research involving laboratory animals exposed to air pollutants through inhalation. Current projects involve the studies of the toxic effects of benzene and other aerosols. The Rodent Inhalation Toxicology Facility is equipped with nose-only exposure units and whole-body exposure chambers that are connected to online equipments that control chamber pressure, as well as monitor temperature, humidity and rate of air-flow through the system. The facility is also equipped with generators for volatile organic compounds (VOCs, e.g., benzene) and liquid aerosols. Photo-ionization detectors for these VOCs can be connected to the system so that chamber concentrations of these test compounds can be automatically monitored using computer software. It is expected that, in the future, the facility will be expanded and certified for contract research. The Aquatic Toxicity Testing Unit at the Chulabhorn Research Institute is a facility that has passed a Good Laboratory Practices (GLP) audit by an external reviewer team certified by the American Board of Toxicology. The GLP audit covered the establishments of a quality assurance plan, standard operating procedures, as well as appropriate data entry and management. Since then, the Aquatic Toxicity Testing Unit has run more than a hundred of the Whole-Effluent Toxicity (WET) tests, and has carried out research on two local marine species to be used as standard test species in Thailand. 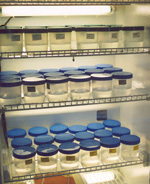 Through this facility, CRI has collaborated with the Petroleum Institute of Thailand (PTT) and Tetra Tech (USA) to identify native species for the Whole-Effluent Toxicity Testing (WETT), and to test the effluents from natural gas-drilling platforms in the Gulf of Thailand in order to determine the toxicity of these test species. The Biological Activity Test and Screening Unit provides a range of screening tests for various biological activities of natural and synthetic compounds. This includes tests for anticancer activities, including cytotoxicity studies, telomerase assays, apoptosis assays, anti-invasion assays, and cancer chemoprevention studies, which are routinely being performed. A panel of cell lines is routinely used for cytotoxicity studies, consisting of 11 cancer cell lines (i.e., KB, A549, H69AR, HuCCA-1, HepG2, S102, MDA-MB-231, T47D, HeLa, HL-60, and P388) and 1 non-cancerous cell line (i.e., MRC-5). The Biological Activity Test and Screening Unit also tests various compounds for their anti-malarial, anti-oxidant, and anti-inflammatory activities. Additionally, analgesic evaluations, motor behavioral studies, toxicological evaluations, and preclinical trials are also conducted at the Chulabhorn Research Institute. Major research facilities include various state-of-the-art research equipments readily available for the 9 laboratories, the integrated research program, and the central facilities. 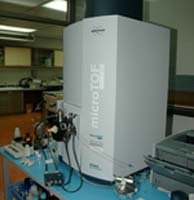 The major equipments for the chemistry research includes NMR Spectrometer 200 MHz, 400 MHz, and 600 MHz; Atomic Absorption Spectrometry (AAS); Gas Chromatography (GC); Gas Chromatography-Mass Spectrometer (GC-MS); GCQ Mass Spectrometer; Time of Flight Mass Spectrometer; Fourier Transform-Infrared (FT-IR) Spectrometer; High Pressure Liquid Chromatography (HPLC); Inductively Coupled Plasma-Mass Spectrometer (ICP-MS); Inductively Coupled Plasma-Atomic Emission Spectrometer (ICP-AES); Liquid Chromatography-Mass Spectrometer-Mass Spectrometer (LC-MS-MS); Spectrofluorometer; UV-Vis Spectrophotometer; NanoDrop Spectrophotometer; Focused Microwave™ Synthesis System; and Digital Polarimeter. The major equipments for the biomedical, environmental health sciences and biotechnology research includes MicroArray System; Gene Expression System; Cytogenetic Analysis System; Histopathology Equipments: Microtome, Tissue Embedding, Tissue Processor; Electrophoresis System; Nucleic Acid Isolation System; Gel Documentation System; DNA Sequencer; Bioanalyzer; Laser Capture Microdissector; ELISA Reader; Bio-assay Reader; Phosphor Imager; Polymerase Chain Reaction; Coulter Counter; and Lumi-Aggregometer.